Search Google for rising Vine stars Jack and Jack and you’ll find very little: Their Vine channel, of course, where they have 4.4 million followers. A one-off story from a local NBC TV news station. Their Wikipedia page. And, misleadingly, Jack and the Box’s Junior Jack burger. 18-year-old Jack Johnson and 17-year-old Jack Gilinsky are so anonymous on the internet that, as a skeptical reporter, I immediately questioned the veracity of the pitch I received about “two of Vine’s hottest stars” and their upcoming performance. I also wonder how the hell two no-name teenagers booked a headlining gig at The Regency, a major concert venue in San Francisco. But I was curious enough about the nature of teen stardom in the social age that I attended anyway. Sure enough, as my Lyft pulled up Van Ness street, my jaw dropped as I spotted the massive crowd of giggling preteen girls looped around the corner, clutching signs and fan paraphernalia in white knuckled grips of excitement. I saw a ridiculous neon tour bus splashed with the faces of these supposed Vine celebrities. And I realized that being famous in the age of social media means you can have a giant tour bus with your face on it and a line of screaming teenage fans, even if no one else in the world cares. Jack Johnson croons to the crowd at The Regency in San Francisco. Jack and Jack –- as their [company]Vine[/company] fans affectionately call them — represent your classic new millennial celebrities. They are slowly building an empire for themselves, shrewdly and carefully plotting their path to stardom and leveraging social media and technology to get there. Johnson and Gilinsky started out where many self-made social celebs do: Filming Vines to make their friends laugh. They met in elementary school in Omaha Nebraska, playing off each others’ antics, staying fast friends as they grew up. At the end of their junior year in high school, they started filming Vines together as a comedy duo, without bigger intentions of fame. But one breakout clip of theirs – “The Nerd Vandals” — went viral. That was all it took to get the celebrity train going. In the six-second clip, they dress up as poindexters, rocking bowties and glasses, and “vandalize” a car’s 4×4 sign with sharpies, adding = 16. Then they giggle and run away. After that clip, Johnson and Gilinsky’s fan base started growing of its own volition. They had 1,000 followers when Jack Johnson went away to summer camp, and when he returned they hit 25,000. Now, roughly a year later, they’re up to 4.4 million followers on Vine, half a million subscribers on YouTube, and more than a million followers apiece on Instagram. They put the original Jack Johnson — the crooning guitar lullaby guy — to shame with his paltry 175,000 Instagram followers. The rabid fandom has given Johnson and Gilinsky the power to pursue something bigger than just six-second Vines: Their dream rap careers. The pair, raised in the era of the selfie, knows all about building a personal brand. They understand instinctively that their social media power is the key to a much larger type of fame. They aren’t winging it — they’re carefully plotting their ascension to the stars. The duo had always enjoyed rapping and writing music, so they expanded their breadth beyond just the Vine medium. They moved on to [company]YouTube[/company], [company]Snapchat[/company] and [company]Instagram[/company] and started releasing original songs on iTunes. At the time of publishing this story, their biggest hit, “Tides,” is currently number 7 on the iTunes charts, behind Taylor Swift’s “Shake It Off” and newcomer Meghan Trainor’s surprise summer hit “All About that Bass.” The only other artists in front of Johnson and Gilinsky are major names like Maroon 5 and Ariana Grande. In other words, the two teen boys are killing it. It’s a testament to the self-made ethos that brought them their fame. It’s also sheer ballsiness that would rarely have been imagined, let alone attempted or pulled off, in previous generations of performers. The music industry gatekeepers have lost their edge and can thank the internet for that. 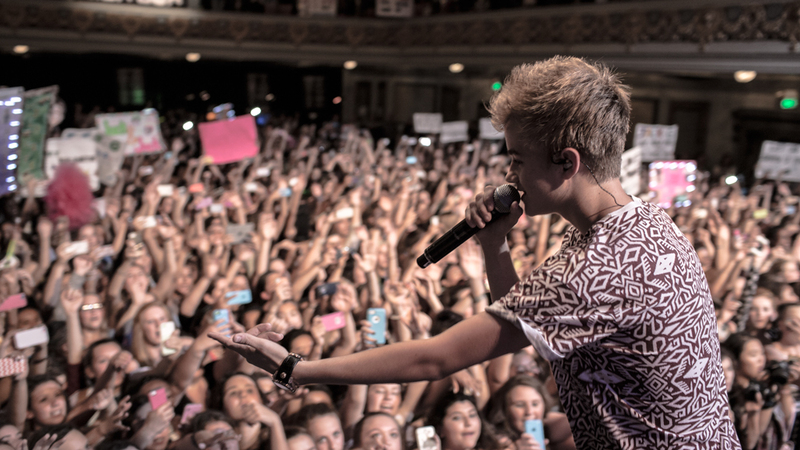 Johnson and Gilinsky know they can market directly to their fans without a middle man. The duo are currently traversing the country in their face-plastered van for “DigiTour.” They’re performing songs and comedy bits for their legions of screaming preteen fans. True to their Vine roots, they open their show as their nerdy Vandals characters — Winston and Eric. “We do it to pay homage to where we got our start,” Johnson says. When their tour wraps up, they’re moving from Nebraska to Los Angeles at the end of September. They’re passing on college for now to pursue their entertainment career. They’re excited to unite with their fellow Vine celebrities, many of whom know each other and are based in Anaheim. If the Jacks keep up their current trajectory, I suspect the rest of the world will eventually figure out the secret.